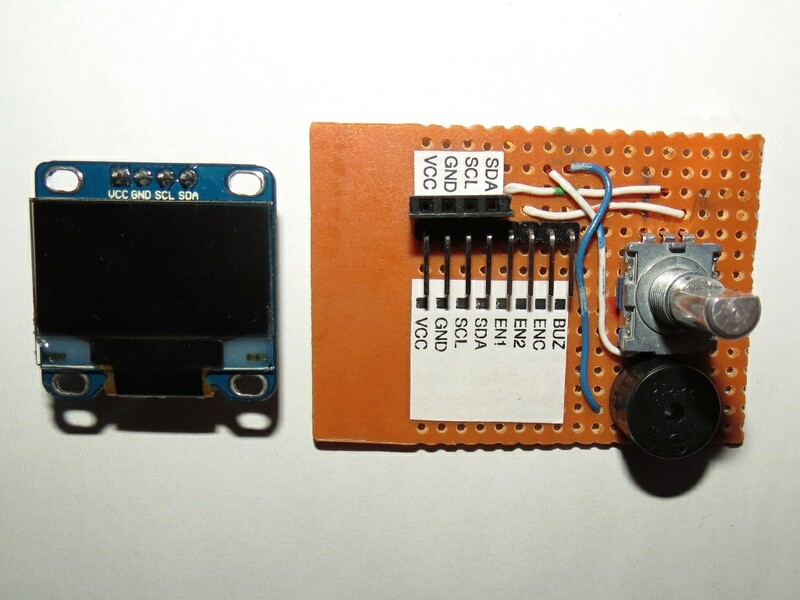 This describes a little DIY project I did for building a I2C based tiny full graphic controller using the SSD1306 128x64 OLED display. 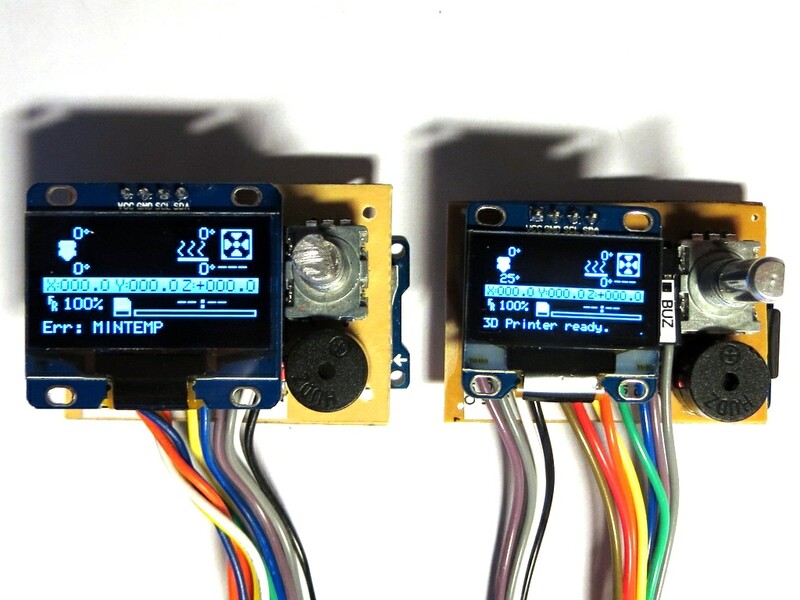 This OLED display comes in two sizes, 0.96" and 1.3", and can be ordered on eBay for a few dollars. So far I only have the 0.96" version, but I have now ordered the 1.3" version. Fortunately, the SSD1306 interface is already supported in U8GLIB, so no programming is needed, just some configuation changes. 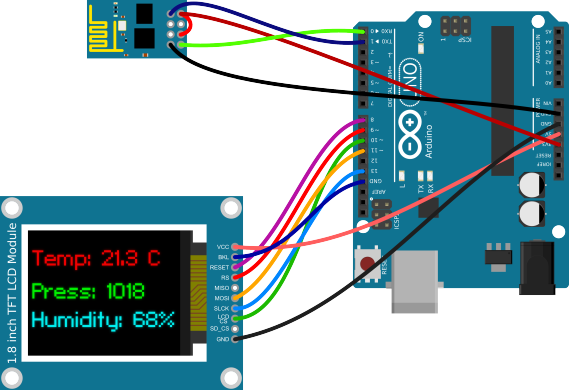 Since the OLED display uses the I2C, only 4 wires (VCC, GND, SCL, SDA) are needed for the display itself. 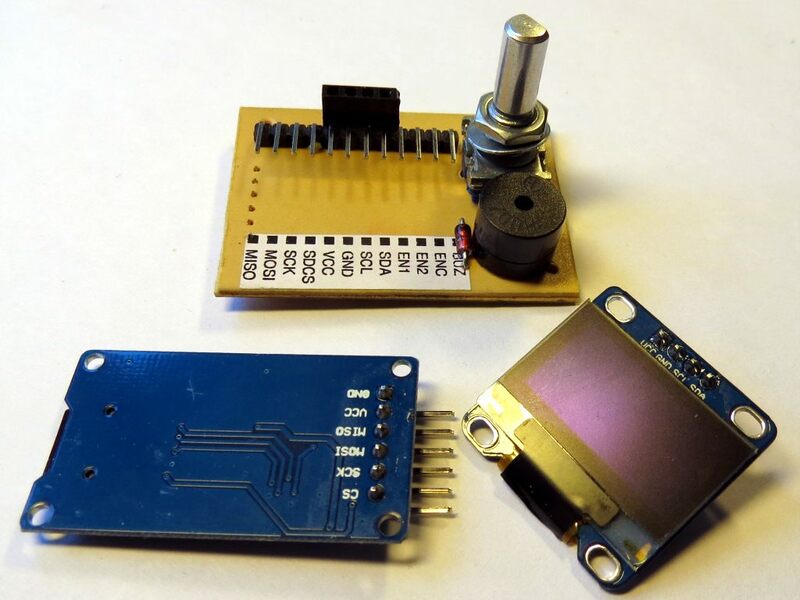 Add to that the 3 signals for the rotary encoder plus one signal for an (optional!) 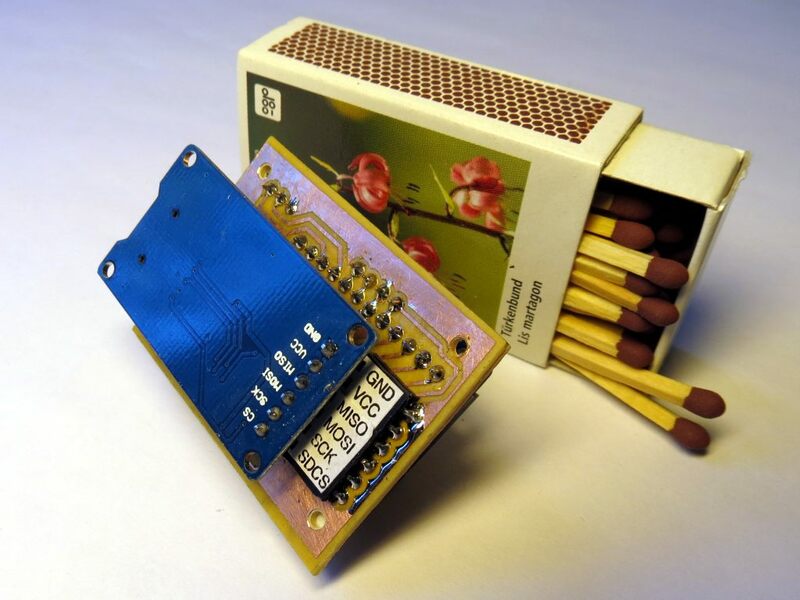 piezo buzzer, to a total need for only 8 wires. I found this especially useful for the Sanguinololu, where not so many additional pins are available. 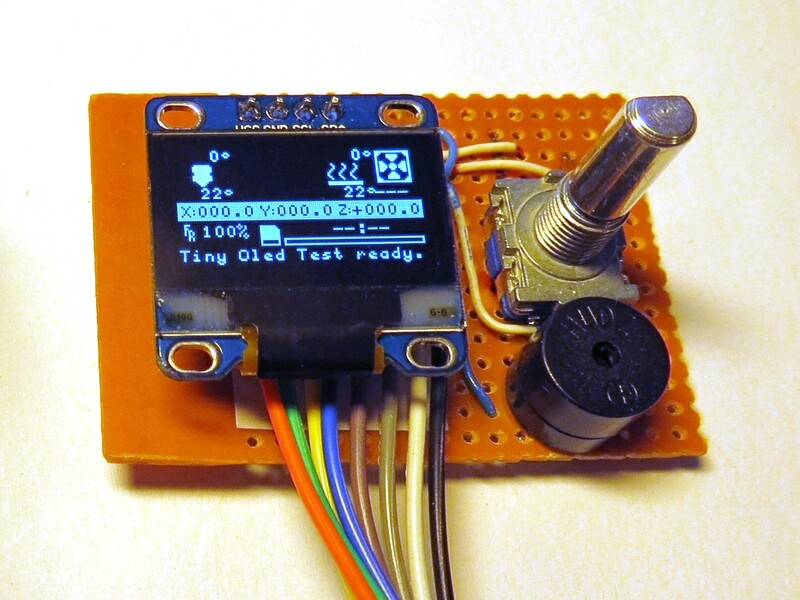 Other advantages of the OLED display are that is really bright, does not need any fiddling with the contrast, only draws a total current of about 8mA and, last but not least, works with either 5V or 3.3V supply and signals - the latter being particularly interesting for ARM based controller boards. The modifications to Marlin are only minimal changes in the files Configuration.h, Conditionals.h, dogm_lcd_implementation.h, pins_SANGUINOLOLU_11.h and pins_RAMPS_13.h. The attached patch file contains all the changes needed to the current version 1.0.3 of Marlin. There's also a 2.42" version. Thank you very much enif for posting this complete information, that is a great project by itself! 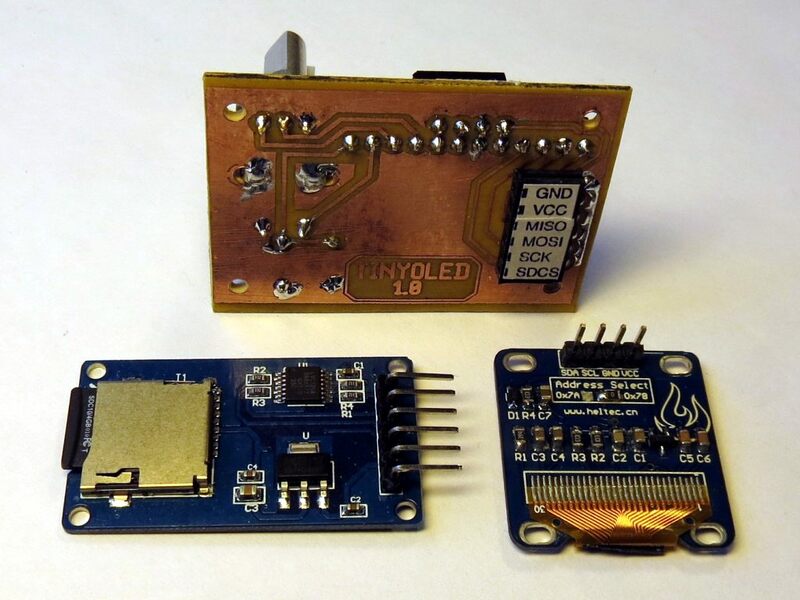 I have ordered a 1.3" OLED module and will be testing it shortly. 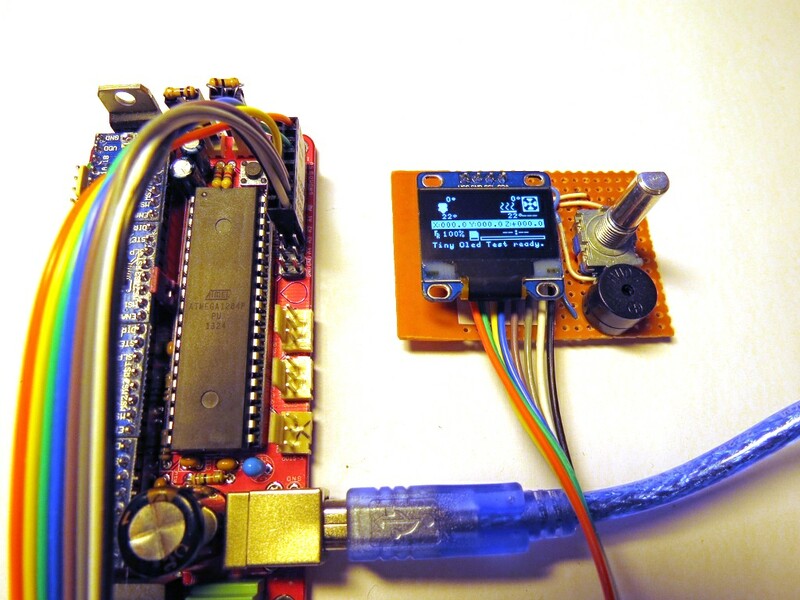 Just one small detail to add: when driving the buzzer with one of the Arduino Due pins, I would suggest adding a single transistor current amplifier, the Due output drivers are really weak compared to the Arduino Mega ones. 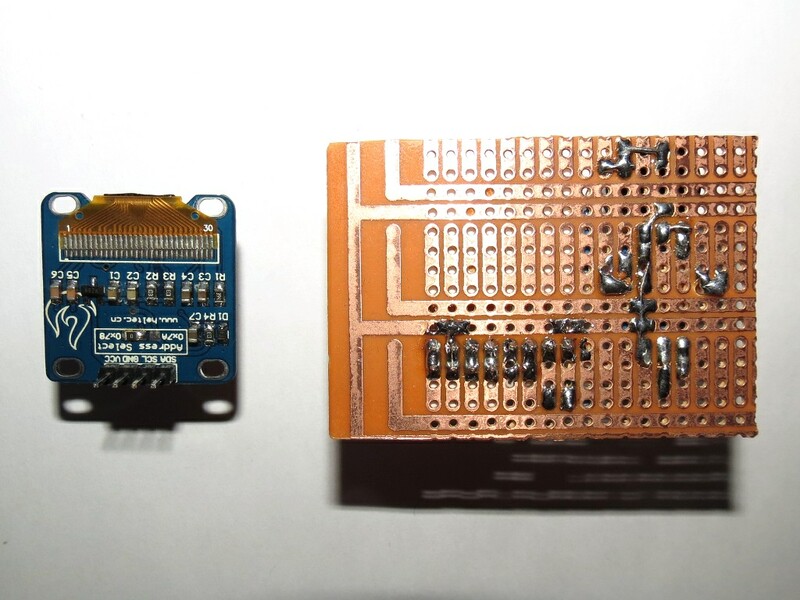 The size of the single sided PCB is 2"x1.5" and a PDF with the layout is attached to this message. Thats excellent. Just nedds a nice 3d printed case now. I can imagine half a dozen far east companies copying this as we read your post. Whatch out it will be on ebay as a complete board soon. Awesome! I definately have some future projects that this will work great on. Since there was still some unused space on the PCB and I am also using the tinyOLED with my "eeprom-less" Arduino Due (using Andrew's RAMPS modifications), I thought why not add to the PCB the option to include an I2C EEPROM. 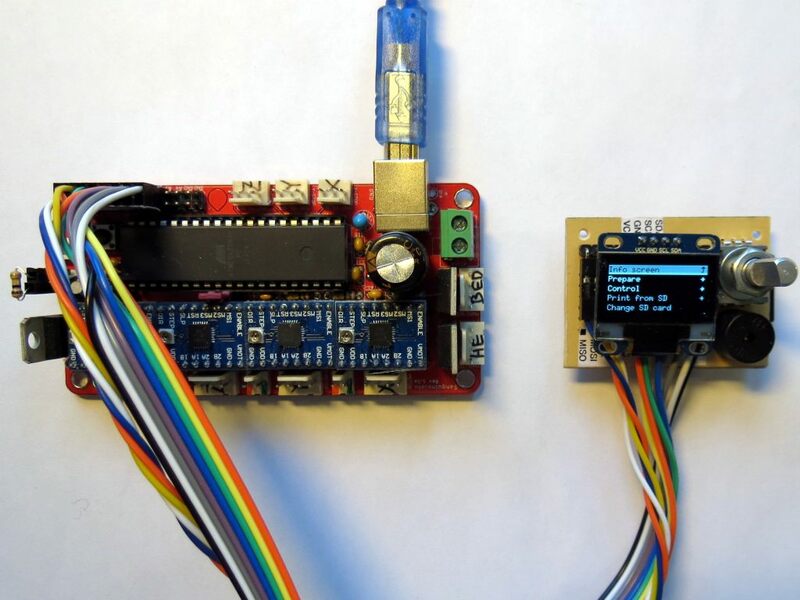 Since you are adding extra options to your already great OLED display design, why not add a small four pin header to connect an $3 ESP8266 Wi-Fi module to one of the unused UART ports on the Due? Edited 1 time(s). Last edit at 04/25/2015 07:49AM by AndrewBCN. As for adding a header for the Wifi module, the RX0/TX0 signals would require 2 extra wires to the tinyOLED (whereas the I2C signals are already there for the display). Also there is already a 4-pin header with exactly the 4 needed signals (VCC, GND, TX0, RX0) on the inner part of standard RAMPS AUX-1 connector. 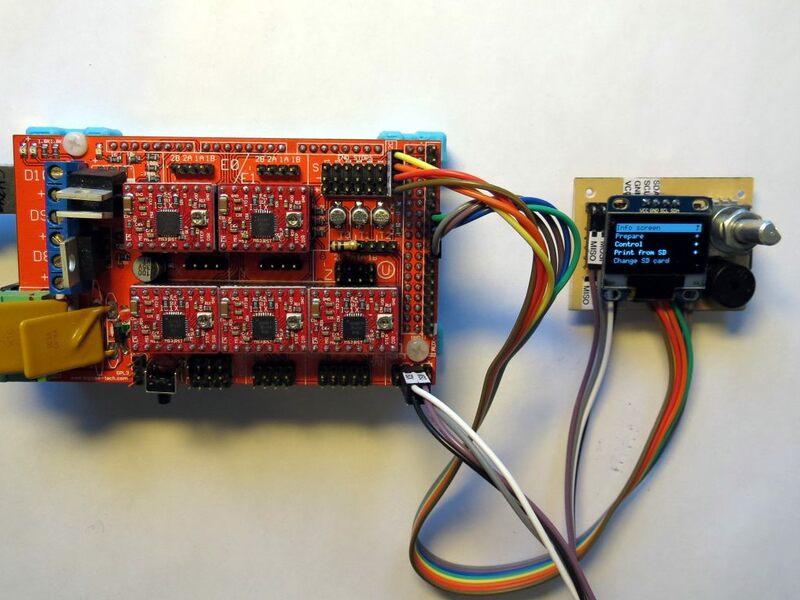 I guess we are all set for a cheap WiFi add-on interface for our Due/RAMPS4Due setup! 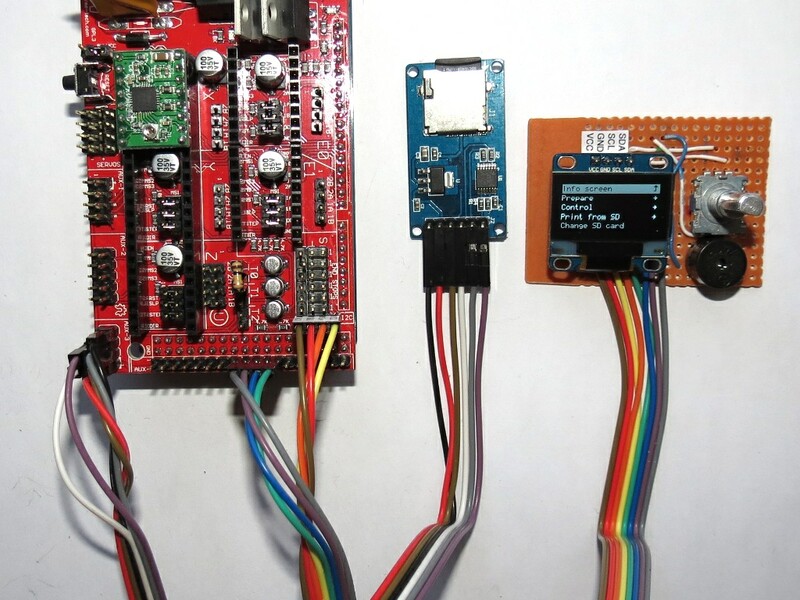 The next step is obviously how to integrate the ESP8266 module with Marlin4Due and test it! Of course, the bigger 1.3" display is somewhat easier on the eyes. As for the current requirements, displaying Marlin's info screen the 1.3" display draws about 12mA, compared to 8mA for the 0.96" display. It is possible to use the larger OLED with the same firmware configuration as the smaller one, but then the display is slightly shifted to the left (I'd guess about 4 pixels), which leaves an ugly random stripe on the far right of the display. This can be resolved by using for the 1.3" version the U8glib device SH1106 instead of SSD1306. 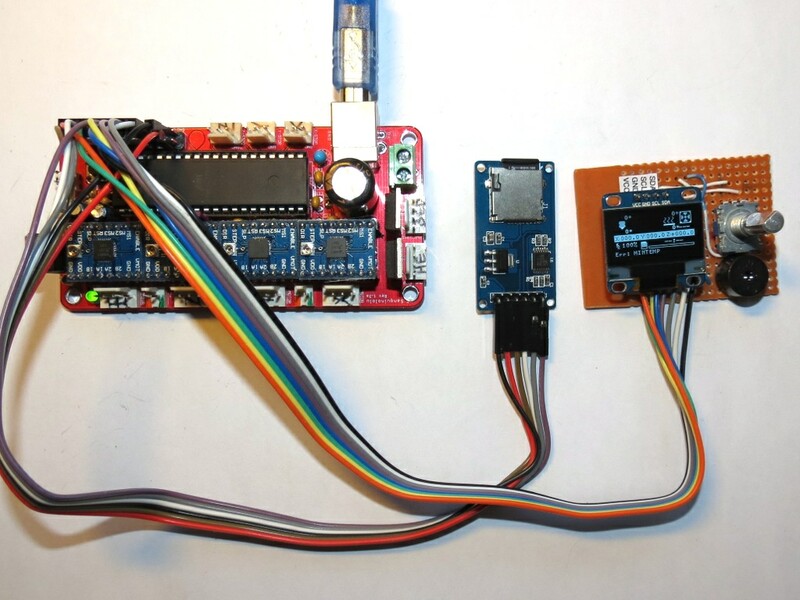 Thus, I have made further small changes to Marlin to allow defining the macro SSD1306_OLED_I2C_CONTROLLER for the 0.96" version and SH1106_OLED_I2C_CONTROLLER for the 1.3" version. The corresponding patch is attached to this message. As usual, an excellent post! 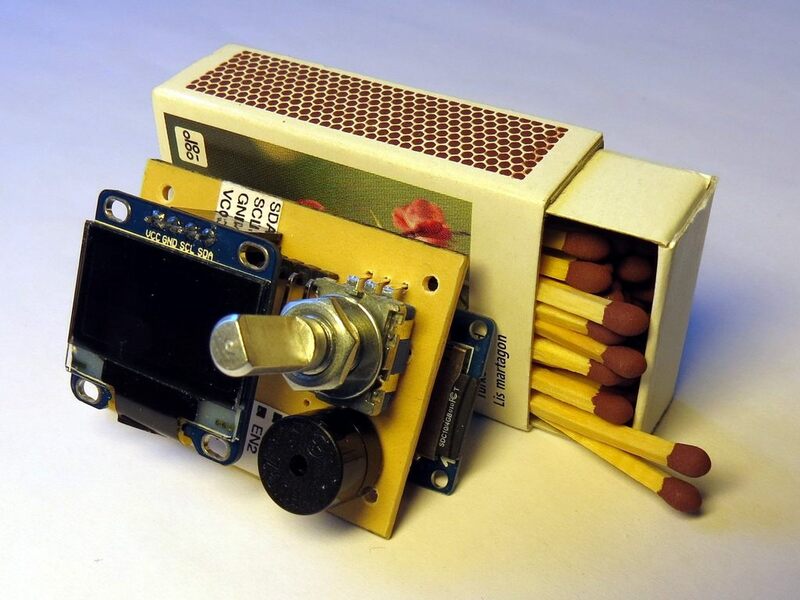 But i don`t know if such a encoder is available that will fit that style. I attached a quick sketch of it, i hope it show`s what i mean. Edited 3 time(s). Last edit at 05/02/2015 03:28AM by Chri. 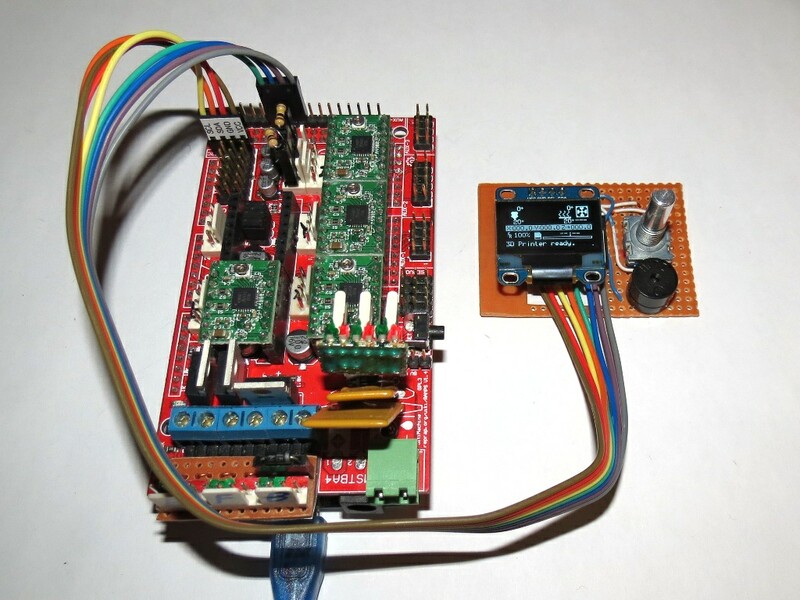 enif, do you any idea how to use regular buttons insted encoder? 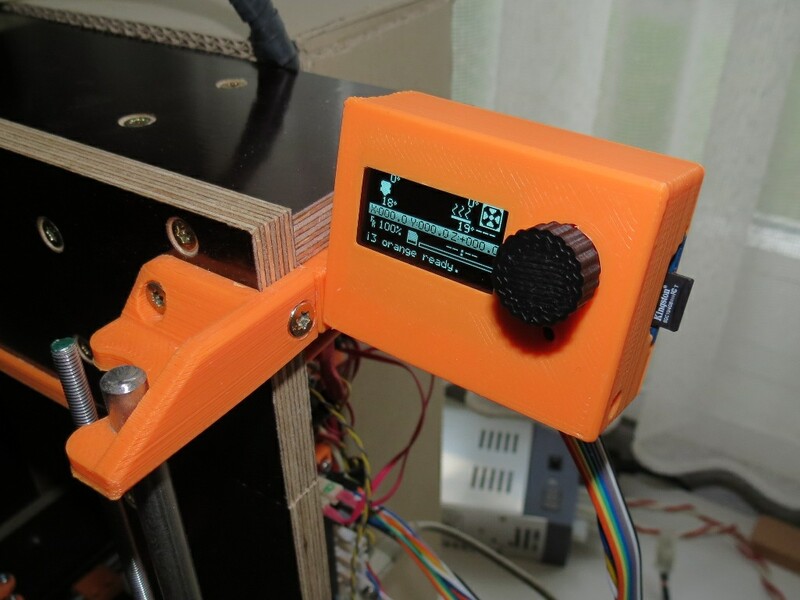 I am going for I2C OLED screen but would like to use buttons like Ultimaker 2. The remote control transmitter brands "JR" & "Spektrum" use a roller style click encoder on many of their models which are a nice "thumb" size and could be mounted horizontally next to the screen. Edited 1 time(s). Last edit at 05/02/2015 10:58PM by bigfilsing. First of all, nice project! 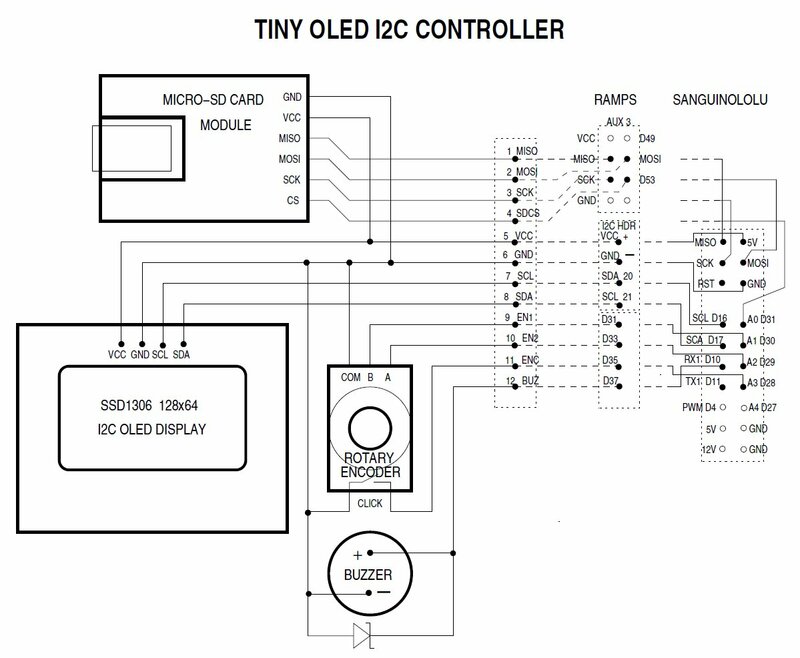 I was looking for a small LCD to attach to my FoldaRap, but I don't know about this kind of tiny OLED screens. Beautiful! 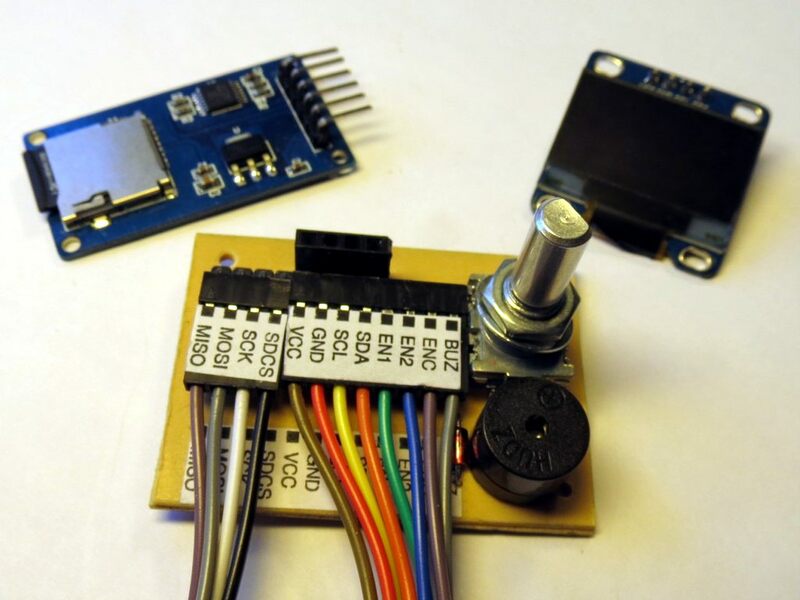 I was also looking for a simple way to replace the encoder with buttons, but the code inside Marlin and the encoder implementation is very hardcoded. My first try will be to use use a standard vertical encoder and somehow mount it horizontally - that shouldn't be too difficult either. Wow - what a selection! 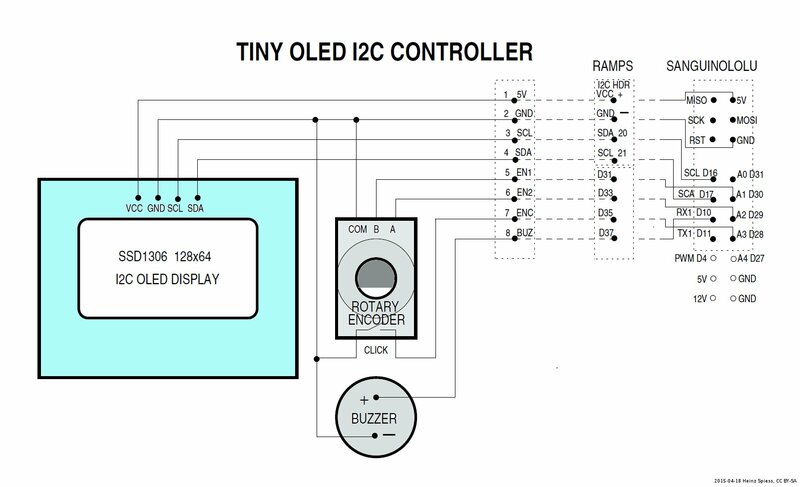 Could it be possible to use 3 buttons connected in same way as encoder? Center button is same connection as press function on encoder, so that will work, but what with up/down buttons? Would a press of a button be registered the same as encoder rotation? Can you try that? No, I am sure that won't work that easily. 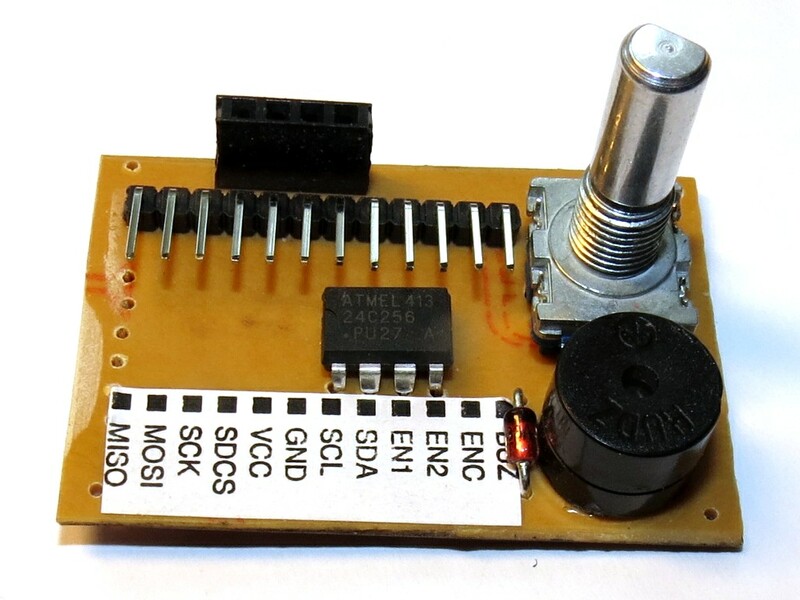 The rotary encoder does not react on individual on-off clicks of the encoder signals, but the software detects a kind of phase shift between them to determine the rotation direction. See [en.wikipedia.org] .